CURVE, Pa. - With the highly-anticipated Pirates-Curve Exhibition scheduled for Saturday, the Pittsburgh Pirates have set the Altoona Curve 25-man roster to start 2013. The 2013 Curve will resemble much of the team that ended 2012 on a six-game winning streak with pieces like Jameson Taillon, the second-overall pick from the 2010 draft, outfielder Adalberto Santos and first-baseman Matt Curry set to return to Curve, Pa. to start 2013. They'll be joined in Altoona by a few new faces like Alex Dickerson, the 2012 Florida State League Player of the Year, shortstop Gift Ngoepe and pitcher Stolmy Pimentel, who was acquired in the Pirates offseason trade with Boston. 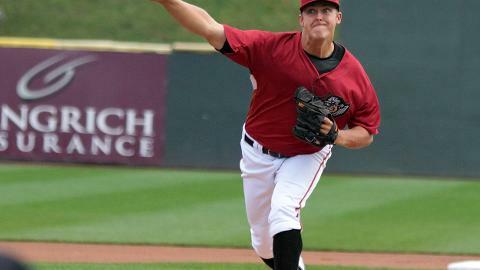 Taillon, the second-best prospect in the Pirates organization according to Baseball America, headlines the Curve's 2013 starting rotation after a short three-start preview in Altoona in 2012. The Woodlands, Texas native flat-out dealt in 2012, earning Eastern League Pitcher of the Week honors for his first week in Double-A where he threw 11 scoreless innings across two starts. He struck out 13 batters in those 11 innings of work and also didn't walk a hitter he faced. Joining Taillon in the starting five will be Pimentel, who was acquired from Boston in the Joel Hanrahan trade this past offseason. Last season, Pimentel spent the year with Double-A Portland where he was 6-7 with a 4.59 ERA in 22 starts. The righty from San Cristobal, D.R. really turned it up after the Eastern League All-Star break in 2012, going 4-3 with a 3.17 ERA in 10 starts. He allowed more than two runs only three times after the break while limiting opponents to a .207 post-All-Star break average. Other members of Altoona's starting five will be RHP Casey Sadler, who will be in his first season at Double-A, Tyler Waldron, who ended 2012 with Altoona, and Brandon Cumpton, who started a team-best 27 games for the Curve in 2012 while going 12-11 with a 3.84 ERA. Altoona's 2013 bullpen will also have a mix of familiar faces from the end of 2012 with names like Tim Alderson, Nathan Baker, Jeff Inman and Jason Townsend. The returning quartet will be joined by Ethan Hollingsworth, Kenn Kasparek and Luis Sanz. Hollingsworth was selected in the most recent Rule 5 draft from the Kansas City Royals system. Kasparek will be entering his first full season in the Pirates organization after joining them mid-way through 2012 and being assigned to Bradenton. Sanz, not to be confused with his brother of the same name in the Tigers system, was signed by the Pirates as a minor league free agent in the offseason after an 11-3 year with a 3.46 ERA In 23 games (16 starts) for High-A Lakeland. Managing the Curve pitching staff behind the plate in 2013 will be newcomer Carlos Paulino and returnee Charlie Cutler. Paulino spent the last two seasons in High-A Bradenton and will be in his first season at the Double-A level. Cutler batted .296 in 55 games for the Curve a year ago while splitting time with Tony Sanchez and Ramon Cabrera. On the infield, the Curve will continue the mix of new and returning players to start the 2013 season. Leading the list of newcomers will be Dickerson, who as mentioned earlier was the Florida State League Player of the Year in 2012 for Bradenton. A third-round pick in the 2010 draft out of Indiana, Dickerson tore through the FSL in 2012, hitting .295 while smashing 31 doubles and 13 homers to go along with 90 RBI in 129 games. Dickerson enters the 2013 season tabbed as the 11th-best prospect in the Pirates system according to Baseball America. Also joining the fold will be the shortstop Ngoepe, who will play up the middle of the infield with returnee Jarek Cunningham back to play second base. Ngoepe, 23, was born in Pietersburg, South Africa and is listed by Baseball America as being the best defensive infielder in the system while also being the 30th-best prospect in the Pirates farm system. Last season with High-A Bradenton, Ngoepe hit a career-best nine home runs while playing in a career-high 124 games. Curry will start the 2013 season in a Curve uniform after hitting .285 with 34 doubles, five triples, 11 homers and 76 RBI in 111 games with Altoona in 2012. Joining Curry in the infield will be returnees Drew Maggi and Stefan Welch, who is fresh off an appearance for Australia in the World Baseball Classic earlier this month. The Curve outfield will have its mix of fresh faces and veterans as well when the 2013 season gets underway. Mel Rojas, Jr., the son of former MLB pitcher Mel Rojas, will patrol centerfield for Altoona after spending all of 2012 with Bradenton. Rojas has been a model of sturdiness in each of the past two seasons, playing in at least 130 games in both. Alongside Rojas in the vast expanse of the Peoples Natural Gas Field outfield will be returnees Andrew Lambo and Santos, who both ended the 2012 season with Altoona. Lambo missed most of the 2012 season due to injury but came on strong when he returned in late August, hitting .276 over 17 games with four homers and 12 driven in. Santos, like Lambo, missed time in 2012 due to injury but when he was in the lineup was a force to be reckoned with. In 68 games, Santos batted .340 with 12 doubles, two triples, two homers and 28 RBI with an on-base percentage of .425. He also added 17 steals in 25 attempts to lead the team. Andy Vasquez, who played in Altoona's final two games in 2012, and Justin Howard will also see time in the Curve outfield. Howard, a 24th-round pick out of New Mexico in 2010, batted .283 in 83 games for Bradenton in 2012 with 14 doubles. Altoona hosts its parent club the Pittsburgh Pirates in an exhibition game set for 2 p.m. tomorrow from Peoples Natural Gas Field in Curve, Pa. Taking the hill for the Buccos in the matchup will be RHP James McDonald, who makes his final tune up of the spring before the regular season gets underway. Toeing the slab in a starting role for the Curve will be Pirates righty Jason Grilli, who will be followed by three Bucco relievers in Jared Hughes, Tony Watson and Justin Wilson. The trio of Hughes, Watson and Wilson all pitched for the Curve in their rise to Pittsburgh. The game is sold out but will be televised locally on Fox 8 with the pregame show beginning at 1:30 p.m. Mike Passanisi and Stan Belinda will take the call on the TV side. For those that would like to listen to the game, it will be broadcast on the Pirates Radio Network by Tim Neverett and John Wehner while the Curve broadcast will take place on the Curve Radio Network with Jon Laaser and Nate Bowen on the call.